I would venture to say that we all want the perfect blush. The best ones I have seen are never too obvious. It’s got to look like a natural flush, one bestowed upon you by your good genes and the graces of God (naturally). Luckily, some of the most beautiful blushes I have seen on beautiful women are not naturally bestowed so there is still hope for us all. In my long search for the perfect blush, I have experimented with all sorts of colours, textures and application styles. Interestingly, in this search, I’ve learned not to judge a blush by its cover (or colour in the pan). Some of the very best shades I’ve ever tried are garish in the pan. Ok, that’s what it’s really called! 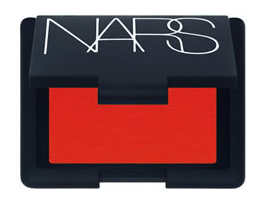 Exhibit A by Nars is truly a frightening shade of coquelicot orange-red. I hardly ever see this blush in Sephora’s Nars counters which is astounding to me. The colour alone is so compelling, so vivid, that you can’t help but be drawn to it. Maybe this lusty shade of red has been deemed a niche blush. Well, if your niche is the perfect, passionate flush, I guess you should seek out Exhibit A. Like other Nars powder blushes, this blush is richly pigmented and buildable. It would suit many skins tones, but the amount you apply will really depend on your preference and skin tone. The texture of this blush is quite unforgiving if applied with a heavy hand. If you want that fresh from the outside, winterey, rosy-cheek look, try this out with a skunk brush or a light hand. I also tap the pan with my finger, lightly pat on my cheekbone below the eyes, and blend, blend, blend. Oh lord. Exhibit A is a beauty. If you like the effect of cheek tint, but want to try something a little different, do a little detective work and find this blush. 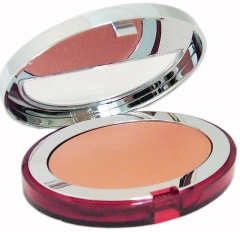 Now, for my everyday no-fuss blush, I want to introduce another top-notch contender: Clarins Multi-Blush Cream Compact in Apricot. According to the product description, these blushes (available in three shades) can be used on the cheeks, eyes and lips. The colour I have is Apricot, a burnt orange in the pan. I have quite fair skin so while I love a great pink, I tend to look for peachy tones or pinks with a little soft taupe in them to avoid making my face any redder than it already is. Another part of my peach-love has to with a weird makeup obsession that started for me watching the movie Cry-Baby starring Johnny Depp and Amy Locane, all those years ago. So many amazing looks in this movie, but I was always a little smitten with Amy Locane’s natural orange hued blushes and eyeshadows. The Clarins Apricot Multi-Blush spotted me in a crowded Shoppers Drug Mart and called me out and immediately, I thought of Amy Locane in Cry-Baby. and softens immediately into a powdery, smooth finish on your skin. There is no shimmer in these blushes that I can see, but it does imbue your cheeks with a lovely soft glow. I would almost say it’s matte, but there’s something else going on here that gives that je-ne-sais-quoi vibe. What I love about this blush is the ease of application (this is so key for me), the lasting power, and the perfect pale orange flush of colour. Again, a colour some people might shy away from at the makeup counter, particularly when it’s placed next to a cotton-candy pink or a classic rose or bronze. Please consider this post a public service announcement. When you see a blush that is a bit hideous in the pan, or maybe just a little scary, give it a test run. The perfect blush is out there! 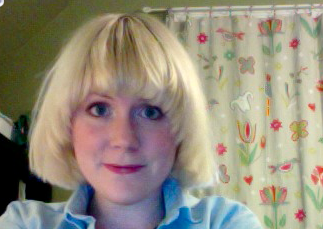 Guest Poster Kristina is 26 and is a secret make up and skincare fanatic.